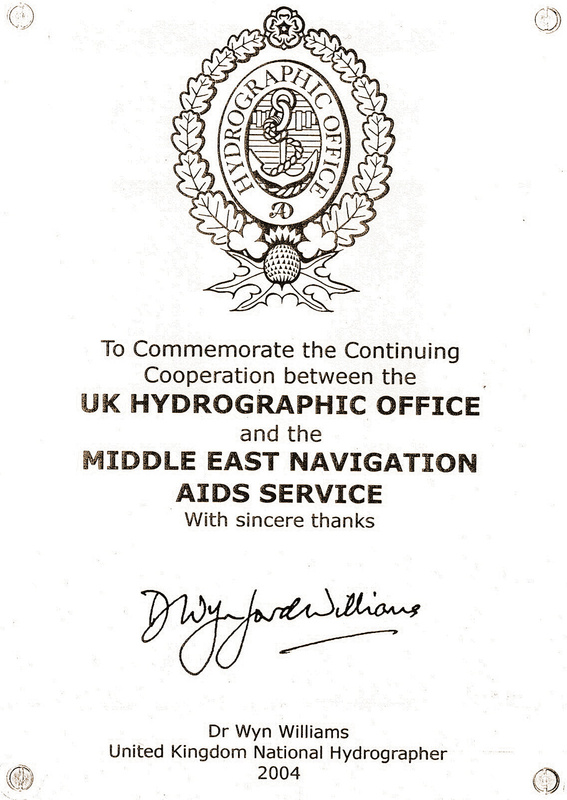 For over 100 years, Middle East Navigation Aids Service (MENAS) has played a major role in the safety of shipping and in the development of Aids to Navigation infrastructure throughout the Gulf waters. Formerly named the Persian Gulf Lighting Service, it was established to be the responsible authority for Aids to Navigation in the region. It is currently the Gulf region’s leading innovator in the development, fabrication, supply and maintenance of Aids to Navigation (AtoN). Operating from its main base in Bahrain and a support base in Abu Dhabi, MENAS owns and maintains an extensive network of buoys, lighthouses, racons, AIS and DGPS transmitters. It also provides essential information and advice such as the issuance of Notices to Mariners, advising on hazards to shipping and additions to navigation charts for the Gulf. Over 2,000 vessels rely upon MENAS equipment and services each month. MENAS is the Gulf operations division of the London-based ‘International Foundation for Aids to Navigation’ (IFAN), and is the only independent Aids to Navigation authority in the world, with no country affiliation or national sponsor. It operates an ISO 9001:2015 quality-assured service, certified by Lloyd’s Register Quality Assurance and is an associate member of International Association of Lighthouse Authorities (IALA). It is also a corporate member of the International Marine Contractor Association (IMCA) and maintains active links with various other organisations and hydrographic offices worldwide. The aids to navigation services provided by MENAS are financed by the payment of Nav Dues (or Light Dues) by vessels making trading voyages into the Middle East Gulf. The present tariff is US$1.65 per 100NRT capped to a maximum of 40,000 NRT per trading voyage into the Middle East Gulf, (maximum bill per voyage is US$660) normally paid at the first port where cargo is taken on or discharged. It is a single regional charge for a regional service. Vessels of less than 15,000 NRT have been exempt from MENAS Nav Dues since July 2006. All dues collected are exclusively utilised to cover operating costs and to improve the aids to navigation service in the Middle East Gulf region. It is MENAS policy to comply where appropriate with the recommendations and guidelines issued by the International Association of Marine Aids to Navigation and Lighthouse Authorities (IALA). MENAS is fully committed to implementing the principle set out in SOLAS Chapter V Regulation 13 of providing, either alone or with others, ‘such aids to navigation as the volume of traffic and the degree of risk requires’ in its historic operational areas. Additionally, MENAS is actively involved in international standards setting for Nav Aids, through participation in conferences and workshops, and in research and development contributions to best practice in equipment and processes. Short range visual AtoN. - The marine lanterns, Automatic Identification Systems (AIS) and radar beacons (racons) fitted to all IALA Category 1 MENAS AtoN will be available to the Mariner for at least 998 days in any 1000 day period. Category 2 and Category 3 AtoN will be available to the mariner for 990 and 970 days respectively in any 1000 day period. DGPS Service - The MENAS DGPS service will be available to the Mariner for at least 728.5 days in any 730 day period. MENAS DGPS will provide a positional accuracy of better than 10 meters (2 drms) throughout the coverage area of the beacon system. This will be maintained by integrity checks on transmitted data, system operation and broadcast quality in near real-time (less than 6 seconds). The General Company of Iraqi Ports expressed its thanks and appreciation to the Middle East Navigation Aids Services (MENAS) for its initiative to install and maintain the Shatt-Al-Arab Buoy located at the entrance of Khafga channel, which has great importance for international navigation. Middle East Navigation Aids Service (MENAS) is pleased to announce its on-going participation at the 2018 Seatrade Offshore Marine and Workboats exhibition in the UAE, where it has again taken exhibition space to promote its services. MENAS has been developing a light intensity testing facility since early 2008, where a small black box and a light sensor has been used, then in 2013 the facility was renovated in full compliance with IALA guidelines and recommendations.